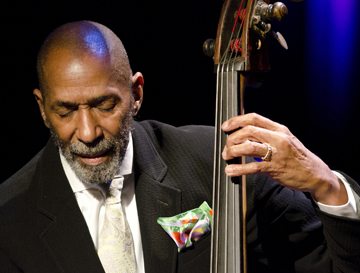 Jazz bassist Ron Carter wants you! After he and his quartet (piano, Renee Rosnes; drums, Payton Crossley; and percussion, Rolando Marales-Matos) confirmed why the 75-year old has long been regarded as the number one jazz bassist in the world today, Ron Carter could have emerged from the stage beaming, pleased by the audience’s standing-O and constant outpouring of applause and adoration for the legend. His swift candor resonated with the backstage group (some even chuckling) that was assembled in the press area, both Blacks and Whites. The Saturday night audience had the good fortune of hearing Carter perform enough good melodies that everyone took every one of them home. After welcoming the crowd to the quartet’s fourth night of a tour that began in Shanghai, China, Carter opened with “You and the Night and the Music” from one of his newer recordings. The 90-minute set doubled as a lesson on what today’s jazz bassists should sound like. As tall and handsomely bearded as ever, Carter ‘instructed’ the audience on recognizable but brilliant versions of standards like “Seven Steps to Heaven” and “Sketches of Spain” as well as tunes from his enormous discography. All one could exclaim after each of his solos was “Wow!” in disbelief at the beauty of what was played as well as the ease with which he plucked the strings. Along with ‘big bass brothers’ Leroy Vinnegar, Milt Hinton, Paul Chambers and Ray Brown, Ron Carter is among the most prolific, most influential, most recorded jazz bassists of all time. With more than 2,000 albums to his credit, he has performed with virtually every major jazz artist, past and present, a very short list including Cannonball Adderley, Tommy Flanagan, Dexter Gordon, Lena Horne, Wes Montgomery and, most notably, from 1963–1968, with the Miles Davis Quintet, as a member of the quintessential jazz group of those days. Most recently, after 18 years on the faculty of the music department of The City College of New York (CCNY), he’s now Distinguished Professor Emeritus there. Thankfully for jazz lovers, as a performer, he remains as active as ever. So do yourself — and Ron — a favor: Come out and see him the next time he’s in town.